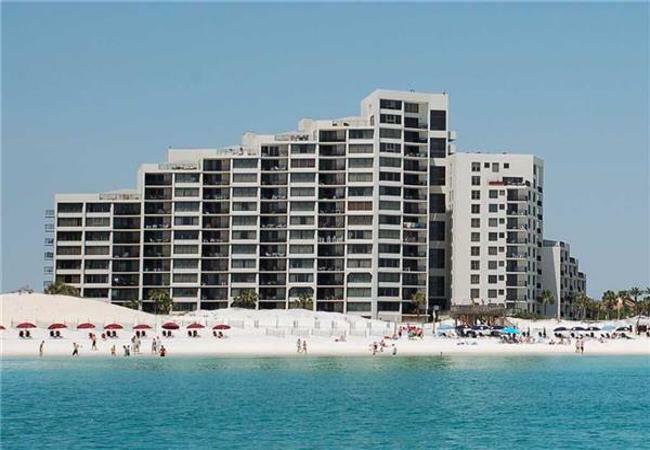 Beachside is a gorgeous condominium complex strategically located over the stunning white sand beaches of the Gulf of Mexico in Destin , FL. If you’re looking to relax and let go of your worries, you can do so in our ample balconies in a private beach-to-bay area. Sandestin Beachside offers dozens of amenities and rentals. Feel free to choose between our multiple floorplans including studios and one to three-bedroom units. A few other perks include spacious balconies with wonderful views of the Gulf, tall glass doors that open up the rooms, and direct access to the beaches. In our condos, you can enjoy beautifully crafted natural stone countertops, a full kitchen, full washer and dryer units, as well as open floor plans and furnished options. The master bedroom also offers a breathtaking view of the Gulf. The complex is made up of two towers aptly named Beachside One and Two and includes various amenities available to its residents. A saltwater pool which is seasonally heated, so you can enjoy a tropical feel at any point of the year is available for visitors staying in both towers. There is also a year-round gym if you don’t feel like getting your exercise in outside on the beach. Along with the amenities found within our towers, you can also enjoy outdoor activities provided by the community. Bike riding, access to the bay, and golf courses are all at your disposal when you choose to stay at Beachside. The bike paths can take you on many exciting adventures while the bay access provides views of the other side of the bay while still enjoy the beautiful white sands. If you’re not into a crowded beach, the bay access will provide with a calmer and more private beach experience. If this wasn’t enough, Destin has some of the greatest golf courses in all of Florida, so if you like the sport, you will definitely enjoy what Sandestin Beachside has to offer. Destin also offers high-class shopping experiences with Silver Sands outlets, the biggest designer outlet in the area, which is walking distance from your room. With over 100 brand name and designer stores, you can be certain you’ll find what you’re looking for. Anything you want, you can find at Silver Sands Outlets. If you prefer smaller scale shopping, a short distance from Silver Sands you’ll find Grand Boulevard, which offers quaint boutiques and upscale dining options as well as a movie theatre. You can be sure you’ll never be bored in Sandestin Beachside. Another fantastic feature Destin offers is water sports. If you’re a fan, this is the place to be. From jet skis to paddle and wakeboarding, you can be sure you and your family will have a great time. You can also rent a boat and check out Crab Island and try your hand at deep sea fishing. In the “World’s Luckiest Fishing Village“, who knows what you might catch!